Home / 100+ Best Celebration of Life Ideas! We have compiled a list of 101 of the best celebration of life ideas. 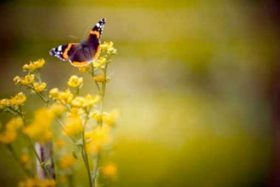 Our hope is that you are inspired to commemorate and remember the wonderful, amazing, and special person that your loved one was, both at the funeral or memorial service, and in the years to come. Are you in the midst of planning a celebration of life ceremony? We’ve created a helpful infographic to guide you through the planning process and to help you craft the perfect celebration of life ceremony that truly captures the essence of who your loved one was and celebrates his or her incredible life. 1. 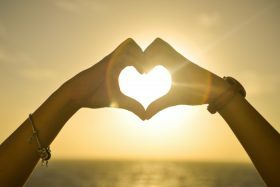 Easily create a unique social media post —a Meme-orial—for a loved one who has passed away on their birthday, a special holiday, the anniversary of their death, or when you are simply missing them. Instantly share your personalized, one-of-a-kind post with family and friends on Facebook, Instagram, Pinterest, or Twitter with the click of a button. 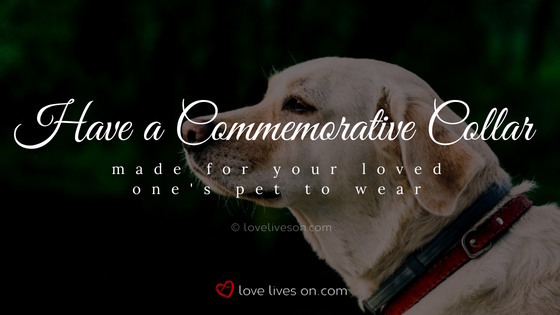 Make a unique tribute now and enjoy reading the memories and comments your special post will generate. 2. Purchase and name a star after your loved one through the International Star Registry Canada. 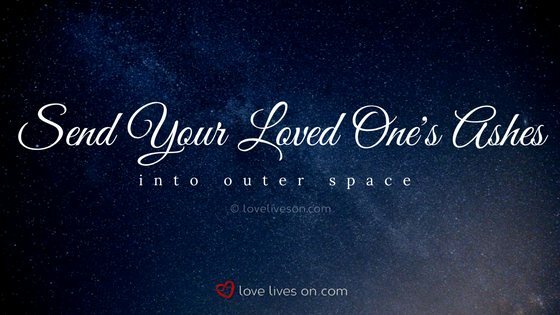 It’s a celebration of life idea that’s “out of this world” (pun intended). 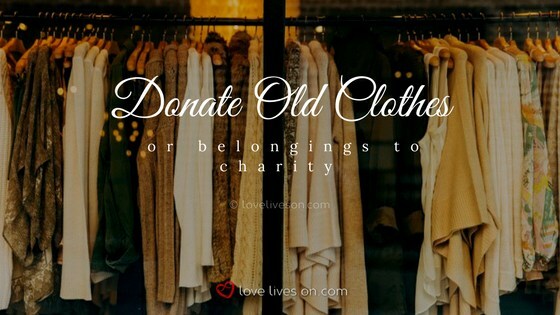 4.Donate some of your loved one’s clothing or belongings to charity. 5. 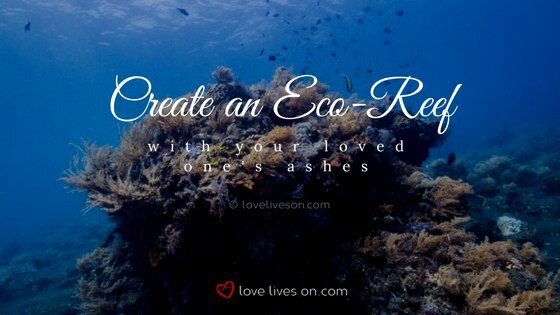 If your loved one enjoyed the ocean or nature in general, contribute your loved one’s ashes to help with the creation of an eco-reef that provides a home for sea life. 6. 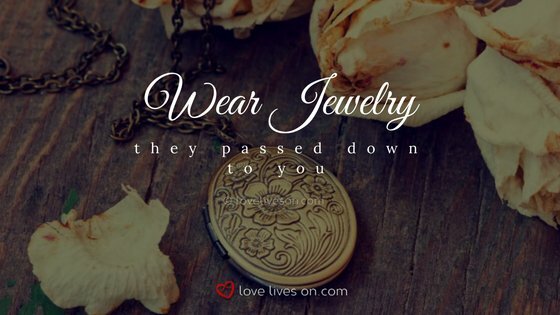 Wear your loved one’s favourite piece of jewelry. It’s a celebration of life idea that anyone can easily do today. 7. 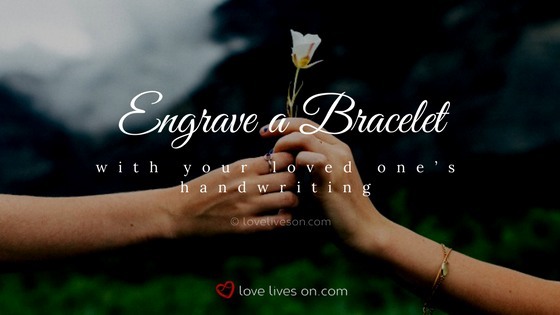 Have a bracelet engraved with your loved one’s signature or how they hand wrote “I love you”. You can find the script to use from an old note or card that you’ve kept. 8. 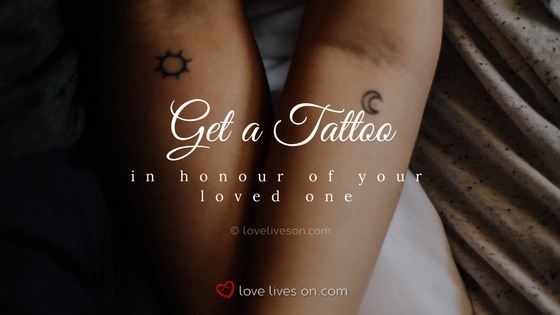 Get a tattoo of something that reminds you of your loved one. This might be your loved ones initials, favourite flower, favourite quote, or the dates of his birth and death. 9. Create a memorial quilt out of old photographs and patches of your loved one’s favourite clothing. 10. Write a note to your loved one and place it in a sealed bottle and drop it in the ocean. If you include your email address, you might get a surprising email one day telling you how far your message has traveled. What a novel celebration of life idea! 11. 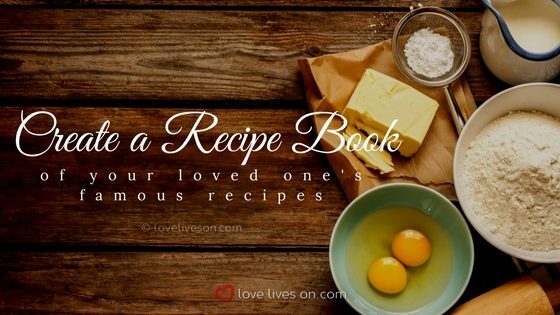 Create a recipe book with your loved one’s famous creations. You could include photographs of family gatherings around the dinner table. 13.Create a quote board by choosing a quote that is special to your family and reminds you of your loved one and put it on a chalkboard, paint it on a wood board of fabric. It can be from their favourite book, movie, poem or something that they used to always say. Add your own personal touches to it that remind you of your loved one and display it at the service. 14. 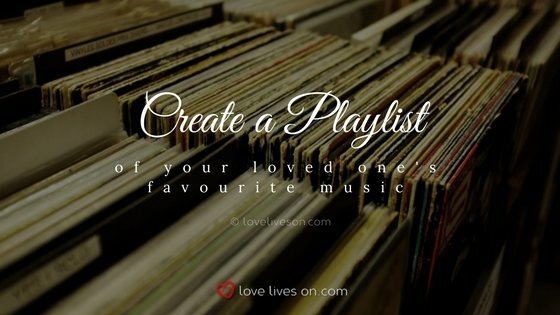 Create a music playlist that reminds you of your loved one and puts a big smile on your face. 15. 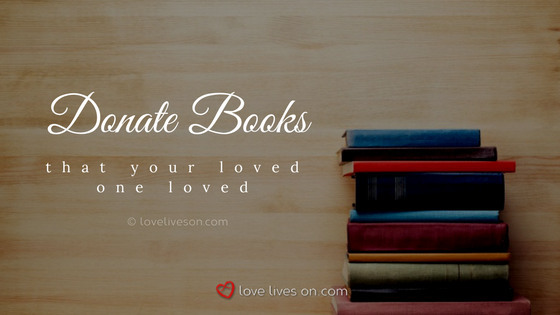 Donate your loved one’s favourite books to a school library with a beautiful certificate affixed on the inside cover that says: “This book was donated in loving memory of [your loved one’s name].” A simple, yet meaningful, celebration of life idea for book lovers everywhere. 16.Create a memorial stone jar where each of your guests write a special memory or something that they loved about your loved one on a rock when they enter the service and place it in the jar. 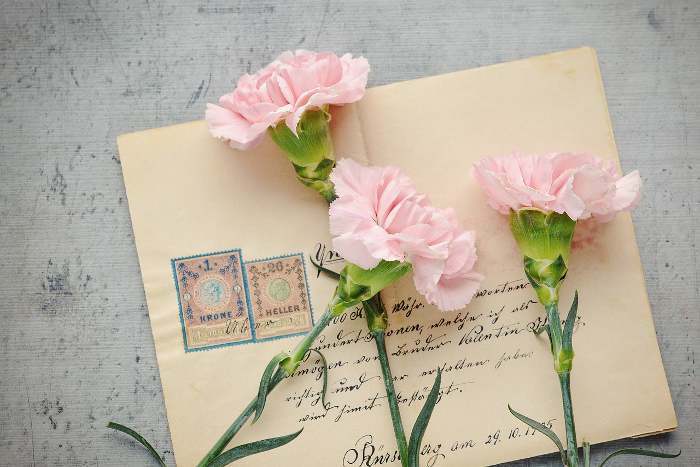 You can then take them home and read them with your family, scatter them in places that were meaningful to the deceased, or display them in your flower garden. 17. 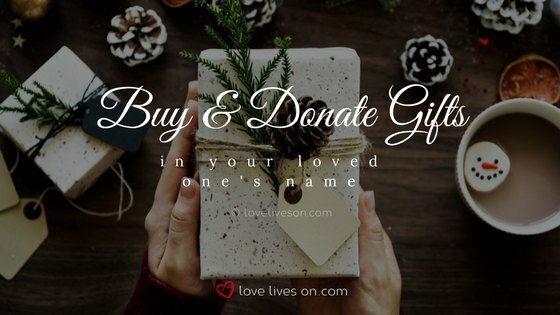 Make a donation to your loved one’s favourite charity in his name. 18. 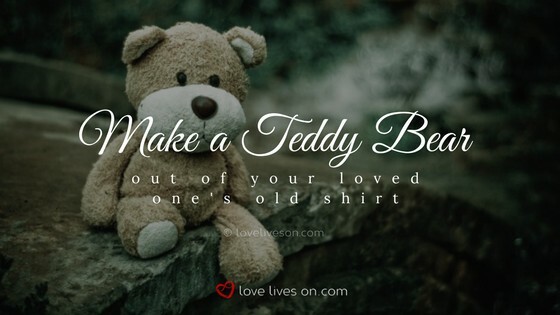 Make a teddy bear for a child out of your loved one’s favourite shirt or other memorable piece of clothing. This celebration of life idea is not only environmentally friendly and encourages recycling, it will help keep your loved one close. 19. 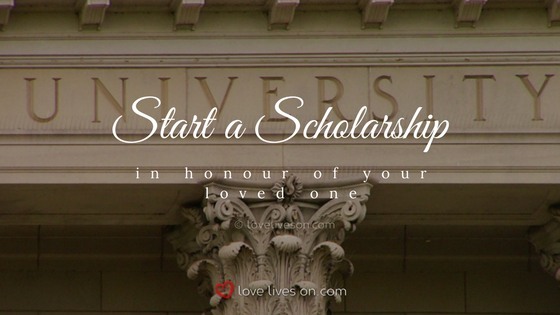 Start a scholarship at a school in your loved one’s name. 20. 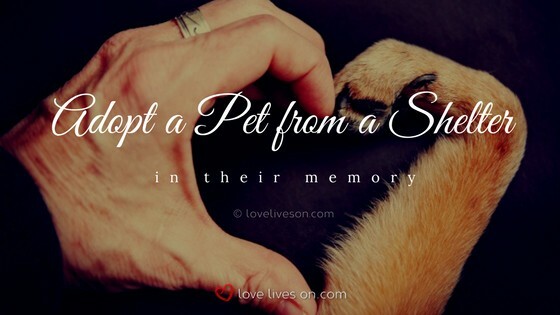 If a loved one who passed away was an animal lover, adopt a dog or cat from your local animal shelter in his memory. You might even name your new pet a name that reminds you of him. 21. Buy gifts for your loved one for his birthday and Christmas and donate them to a local hospital or nursing home. He or she would definitely be proud of this celebration of life idea. 22. 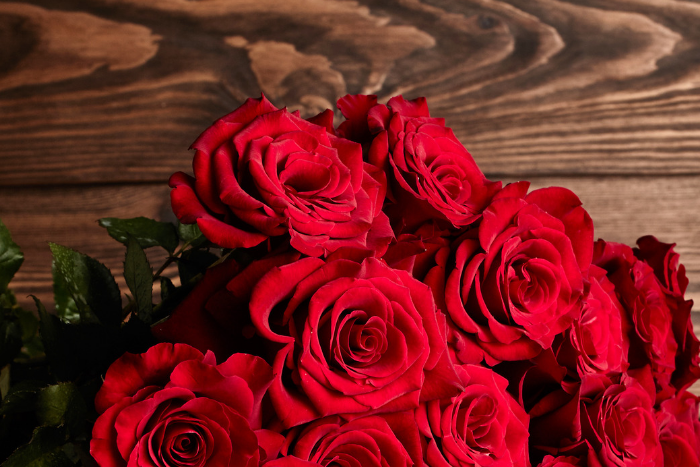 Buy a bouquet of your loved one’s favourite flowers on the anniversary of her death and display them in your home. 23. 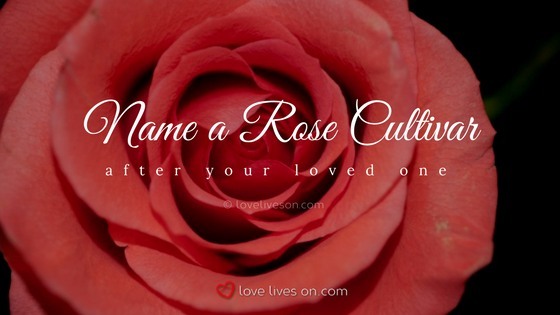 This is one of our favourite celebration of life ideas — have a new rose cultivar named after your loved one. You can view a gallery of roses that are available for naming. You can also purchase cuttings for planting. The name of the rose is then registered with the International Cultivar Registrations Authority. 24. 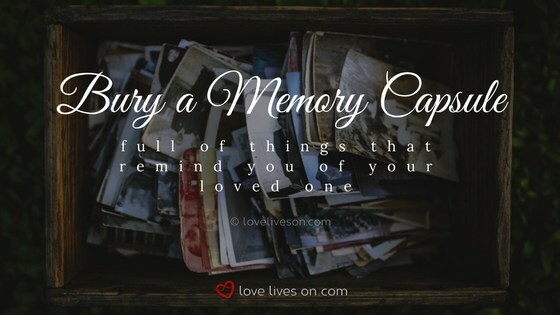 Create a “memory capsule” by placing things that remind you of your loved one in an air-tight container. 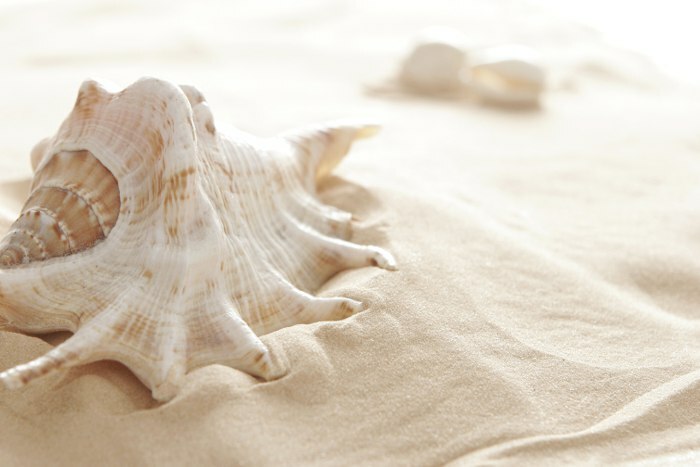 Include items like treasured photographs, cards, books and other mementoes. Bury the memory capsule in the ground with a plan to dig it up in the future. You could also have a burial ceremony with family and friends, as well as a ceremony when the memory capsule is dug up. The burial of the memory capsule can also be included in a celebration of life service. 25. Frame your loved one’s favourite quote or poem and hang it in your home. 26. 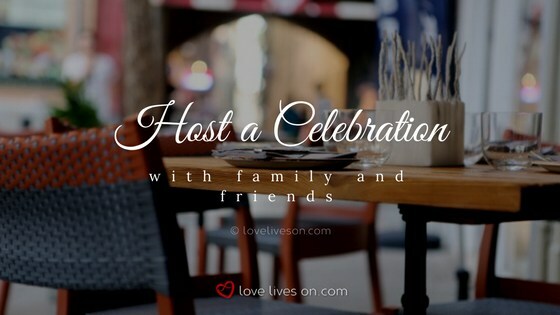 Host a celebration with family and friends on your loved one’s birthday or on the anniversary of his death to celebrate the wonderful life he or she lived. 27. 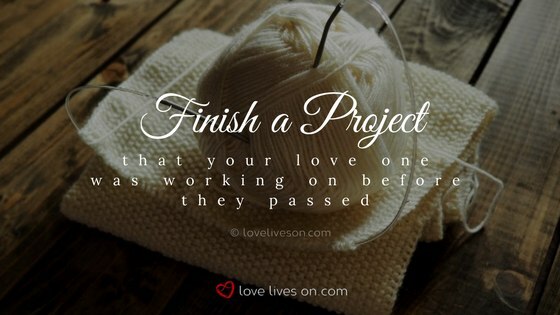 Finish a project that your love one was working on before her passing (for example: knitting a sweater, finishing a painting or a poem). 28. 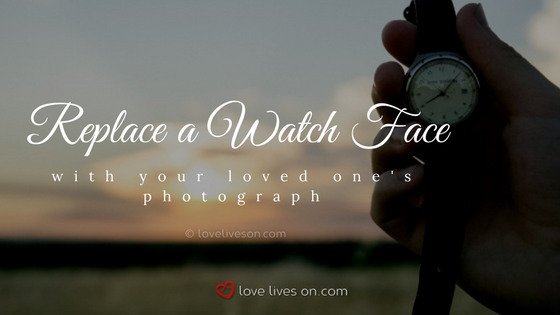 If your loved one had an old watch that no longer works, replace the watch face with your favourite portrait photograph of your loved one. What a simple, but beautiful celebration of life idea! 29. Decorate a tree in your backyard to create a memorial tree. You can fill mason jars halfway with water and float your loved one’s favourite flower or a floating candle in them. Then attach a wire handle to the top of the mason jar and hang them in the tree. You can even add a plaque with her name on it. Or if the bark of the tree is smooth, you could paint her name on the tree in water-based paint. 30. 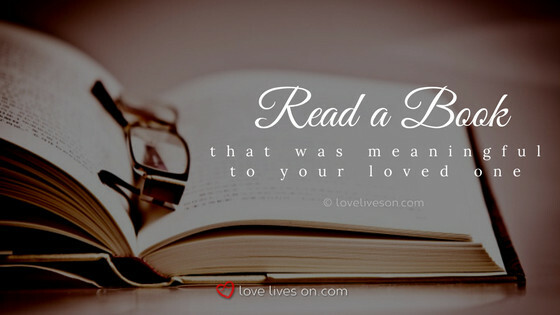 Read your loved one’s favourite book. If he or she liked to underline passages or make notes in the margin, take time to contemplate ideas that inspired him or her. 31. Host a movie marathon where you watch your loved one’s favourite movies with family and friends. 32. 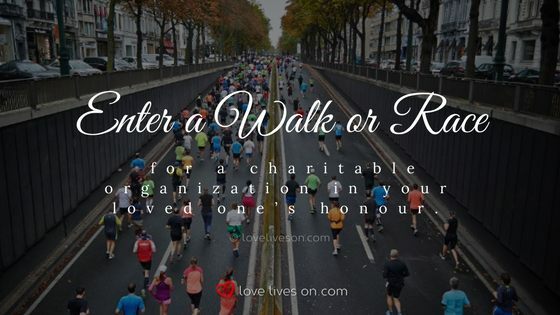 Enter a walk or a race for a charitable organization in your loved one’s honour. For example, if you lost a loved one to cancer, you might participate in the Relay for Life. 33. On a cold and dreary day, cuddle up in your loved one’s cozy sweater and read a book, with a cup of hot cocoa. Spritz your loved one’s favourite perfume or cologne on the sweater to stimulate memories associated with his or her smell. 34. 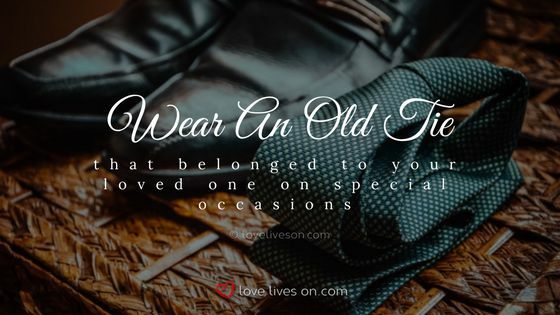 Wear your loved one’s favourite tie on special occasions (for example, a wedding, christening, or a celebration of life service). 35. 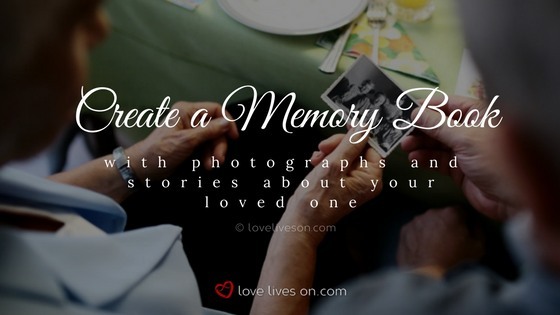 Create a memory book with photographs and stories about your loved one. Ask family members, friends, neighbours and colleagues to contribute. 36. 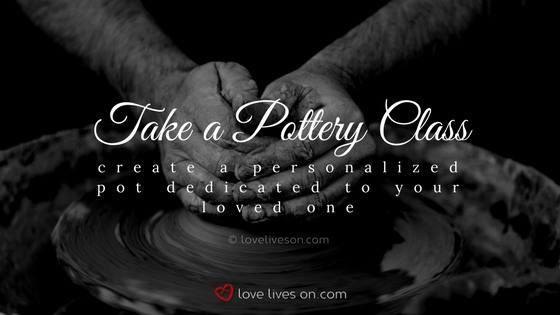 Take a pottery class and create a personalized pot dedicated to your loved one. You can either keep your loved one’s ashes in the pot, or plant your loved one’s favourite flowers in it. 37. If your loved one was a sports lover, deposit ashes on your loved one’s favourite baseball field or golf course. 39. If your loved one was an adventurer, consider having your loved one’s ashes in space. A company named ‘Celestis’ will take a small portion of your loved one’s cremated remains and scatter them in the Earth’s orbit. 40. 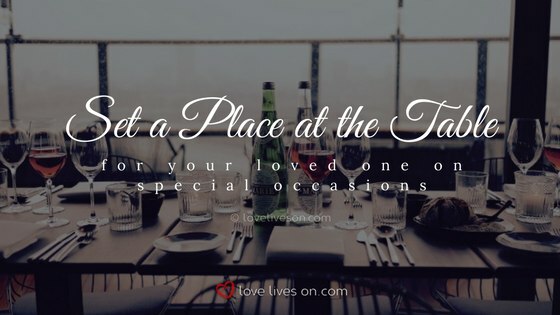 On special family occasions, like Thanksgiving or Christmas dinner, set a place at the table for your loved one with a place card and leave the spot empty. 41. 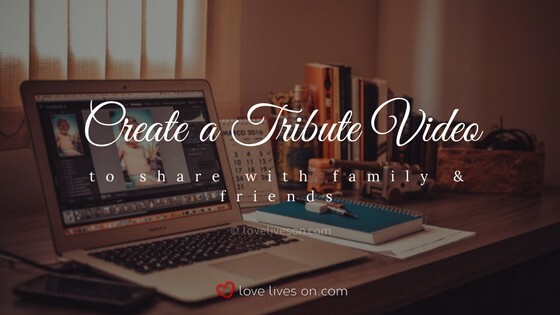 Next time you have a big get-together with family and friends who were also close to your loved one, create a tribute video that features everyone’s favourite stories and memories about him or her. You can easily order a video booth online from SpeechBooth. They’ll ship a high-quality, easy-to-use video recording kit directly to your door anywhere in the USA and Canada. SpeechBooth will also professionally edit your tribute video footage, (as well as provide you with the raw footage). You can give a copy of the tribute video to family and friends. It is sure to become a treasured keepsake for years to come. 42. If you have lost a child, you could donate a toy to a Christmas toy charity in his or her name. 43. If your loved one enjoyed Halloween, carve his or her name into a pumpkin. 44. Looking for celebration of life ideas for someone who loved gardening? 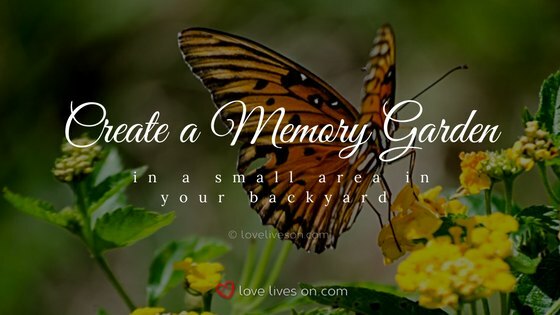 Dedicate a small area in your backyard for a memory garden. Plant your loved one’s favourite flowers, or transplant plants from his or her garden. If your loved one was cremated, you could mix a small amount of the ashes into the soil. Make a small pathway of stepping stones. On the stepping stones, inscribe special dates, or quotes, that remind you of your loved one. 45. 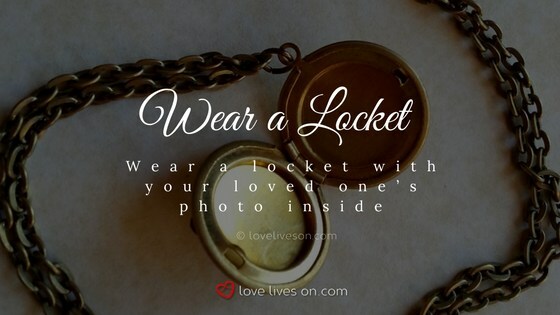 Wear a locket with your loved one’s photograph inside. 46. 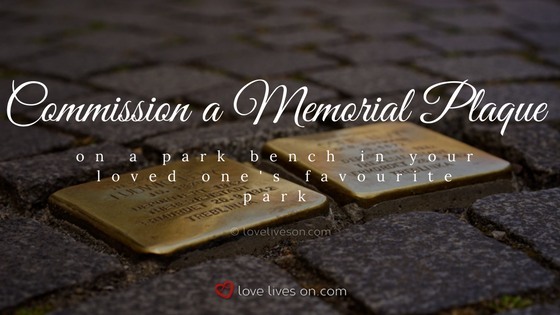 Commission a memorial plaque to be displayed on a park bench at her favourite park. 47. If your loved one was a sports lover, organize family and friends to play his favourite game. You can write your loved one’s name on a ball, puck, racket, or jersey, in his honour. 48. Hang a stocking at Christmas and fill it with cards from family members with their loving memories inscribed in them. Read the cards out aloud at Christmas dinner. 49. 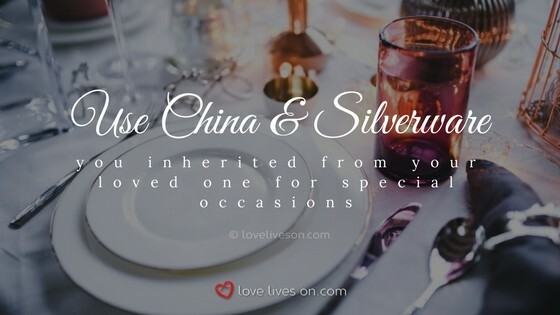 On special occasions, use the china and silverware that you inherited from your loved one. 50. 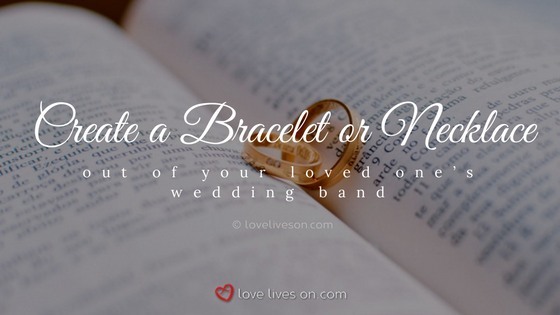 Create a simple bracelet or necklace out of your loved one’s wedding band. This is a new trend in celebration of life ideas. Search for a bespoke jeweller in your area that can help you implement your design. 51. 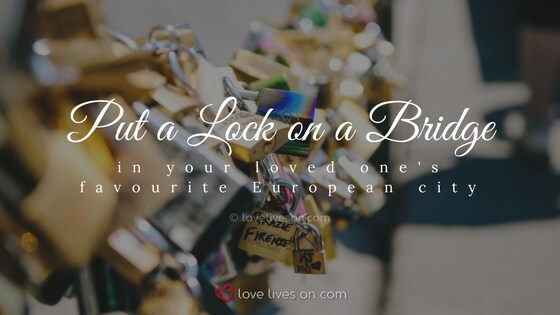 Visit your loved one’s favourite European city and put a lock on a lock bridge. The lock could have his initials engraved on it, along with the date of birth and the date of death. 52. On a seaside vacation, write your loved one’s name in the sand at sunset, and photograph it before it washes away. 53. 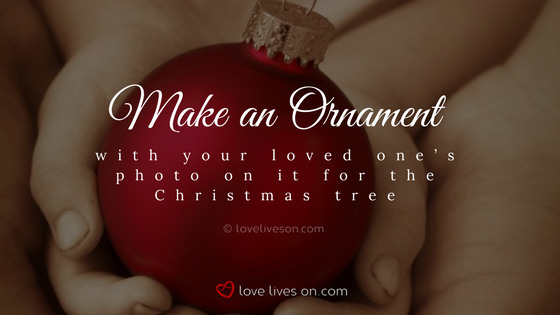 Make an ornament with your loved one’s photo and/or name on it for the Christmas tree. 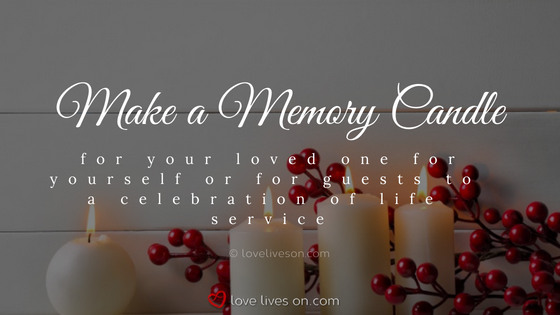 It’s one of our most popular celebration of life ideas during the holiday season. 54. 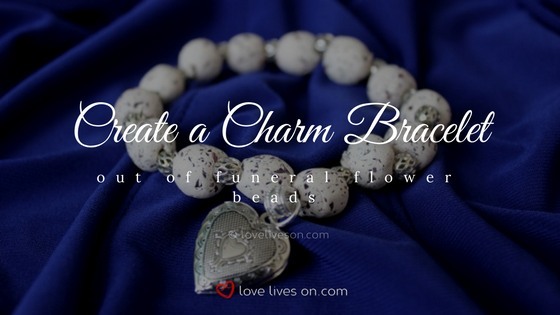 Turn dried funeral flowers into beads, and assemble the beads into a memorial bracelet that you can wear. It’s a unique celebration of life idea. 55. Create a Christmas memory wreath using photographs of your loved one. 56. 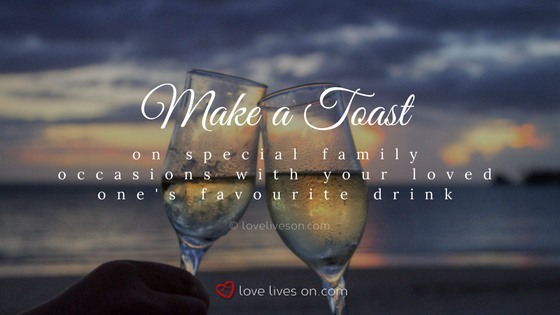 On special family occasions, toast your loved one with his favourite drink. 57. 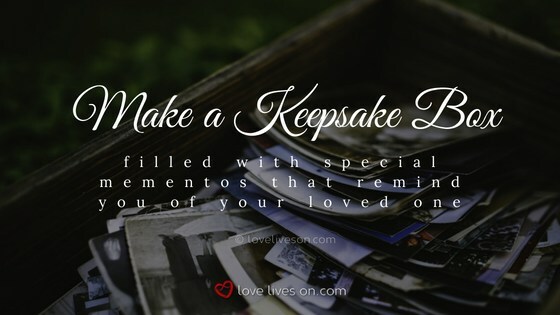 Prepare a keepsake box of things filled with special mementos that remind you of your loved one. 58. When you get married, attach a small charm with framed photograph of your loved one to a ribbon in your bouquet. 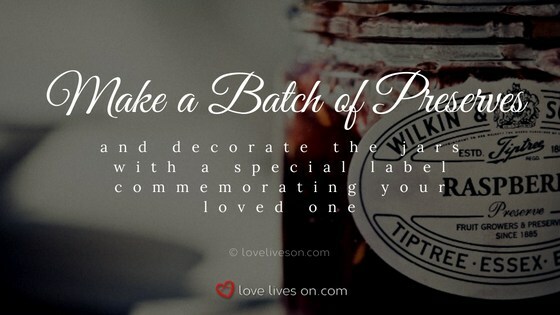 This celebration of life idea will keep your dearly departed close to you during an important event in your life. 59. Cut a piece of fabric of your loved one’s favourite tie or dress in the shape of a heart and sew it into your wedding dress. 60. Give guests to a special occasion, like a celebration of life service, wedding or birthday party, a small bag of “Forget Me Not” seeds to plant in honour of your loved one. 61. Stitch your loved one’s name into the tag or seem of your wedding dress. 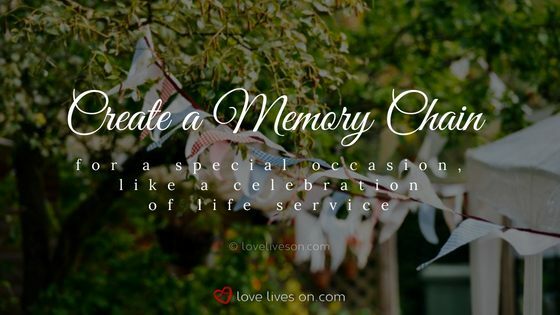 Again, this celebration of life idea is about ensuring that your loved one is part of your special day. 62. 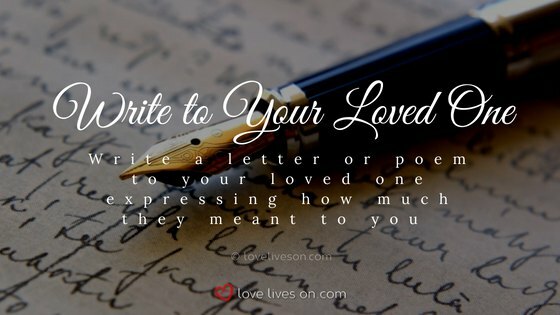 Write a letter or poem to your loved one. Express what he or she meant to you, the difference he or she made to your life, and how much you miss him or her. Write on the envelope a date for opening and reading the letter or poem, and keep the letter in a safe place in the meantime. 63. Visit your loved one’s favourite place and leave a rose or favourite flower there, along with a note: “[Deaceased’s name] loved this place and was happiest here. May [he/she] rest in peace.” It’s a simple celebration of life idea that you can do today. 64. Get an angel’s wings pendent with your loved one’s name engraved on it. 65. 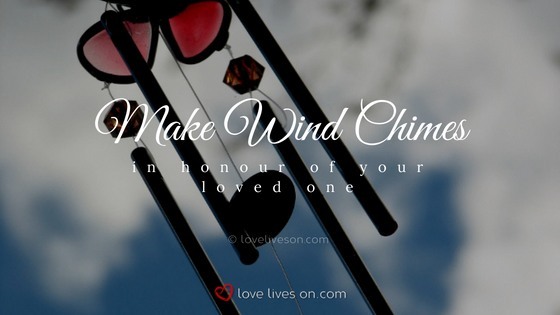 Make wind chimes in honour of your loved one so that when you hear them in a breeze, you think of him or her. You can hang ceramic photographs in your wind chime to personalize it. 66. 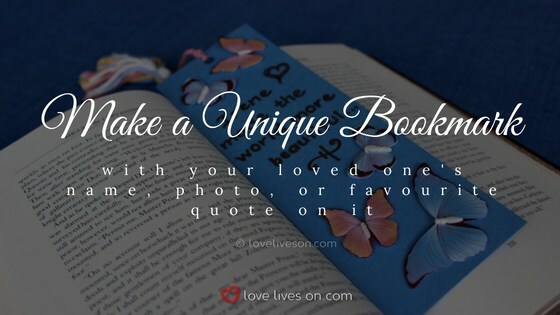 Create a bookmark with your loved one’s name, photograph or favourite quote on it. This would make a lovely gift for guests to a celebration of life service. 67. Knit gloves and hats for a local homeless shelter, with a personalized tag of “[Deceased person’s name] wishes you love and joy”. 68. Create a photo charm that can be attached to clothing or a favourite blanket. 69. Make a memory candle for your loved one. You can make this for yourself or for guests to a celebration of life service. 70. Find a tree in the woods and tie a ribbon around it in your loved one’s favourite colour. Write a quote on the ribbon that reminds you of your loved one, along with her name. 71. 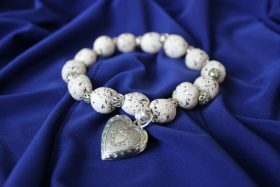 If your loved one was cremated, have a small amount of the ashes compressed into a gemstone. 72. 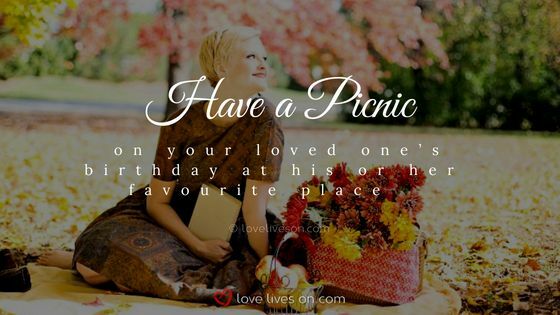 Have a picnic on your loved one’s birthday at his or her favourite place. Pack her favourite dishes, and her favourite wine. This can be done for a celebration of life service, or whenever you wish. 73. 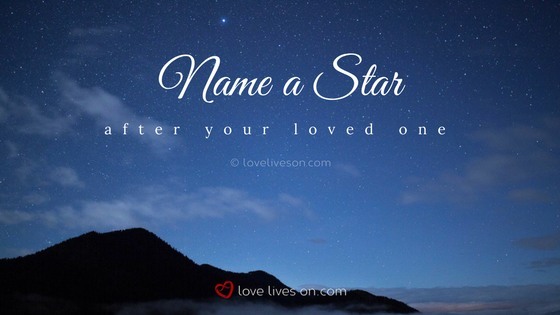 At a special occasion, like a celebration of life service, Christmas, or Valentine’s Day, create a memory chain by writing your favourite memories, loving moments, and your feelings of loss, on long, narrow strips of construction paper. Then form inter-linking loops out of the strips to make a chain you can use to frame a doorway or hang over a fireplace. 74. Create a collage to commemorate your loved one. Use photographs of him or her, as well as places and objects that were significant. Overlay the photographs with quotes that remind you of him or her. 75. Paint or take a photograph of your loved one’s favourite place and hang it in your home. 76. 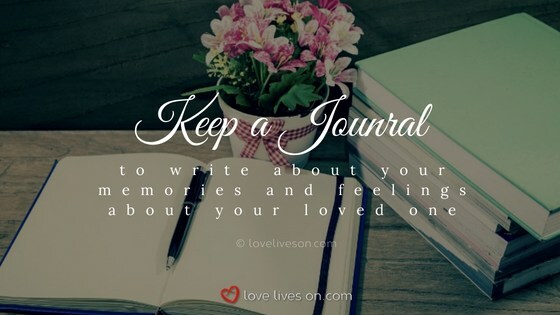 Keep a journal where you continue to write about your memories and feelings about your loved one. 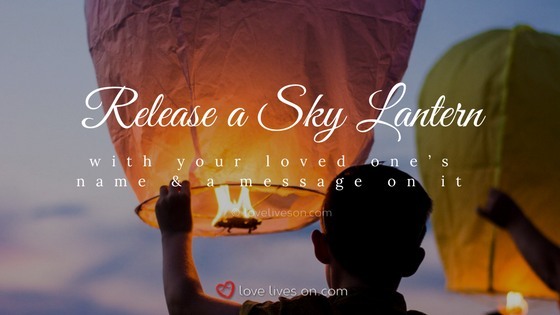 This celebration of life idea is sure to help you in your healing journey. 77. 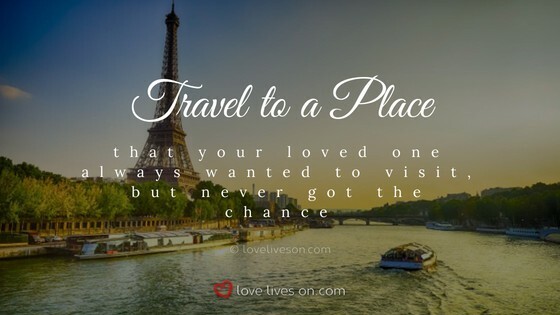 Visit a place that your loved one always wanted to travel to, but never got the chance. If he or she was cremated, scatter some ashes there. 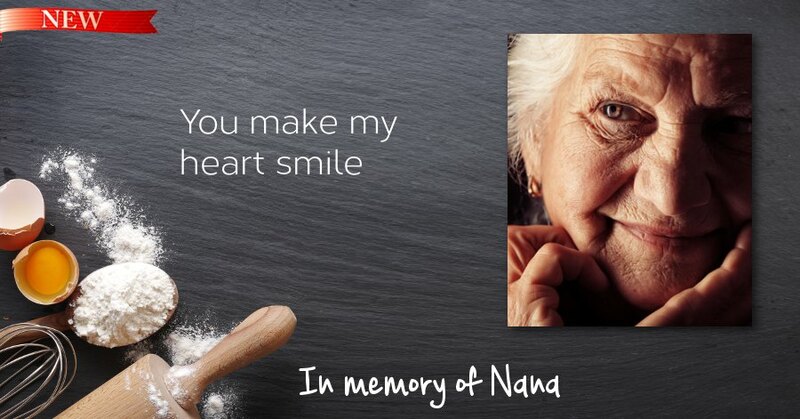 Or set a small memorial with a tea-light and a small laminated photograph. You could also write a small summary about your loved one for other travelers to read, should they come across your little memorial site. 78. 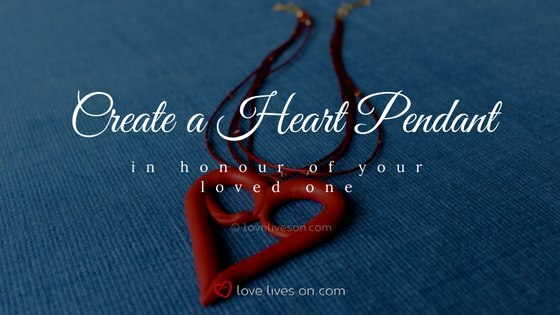 Honour a loved one’s special collection or hobby by participating in that interest or activity (e.g. coin collecting, reading, golfing). 79. Looking for a larger-than-life celebration of life idea? Well, here it is! 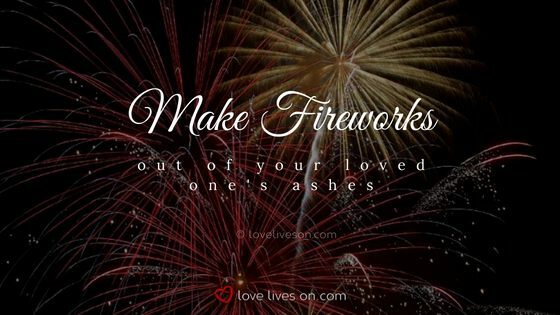 Turn your loved one’s ashes into fireworks and then set them off on his birthday, a special occasion or holiday. 80. 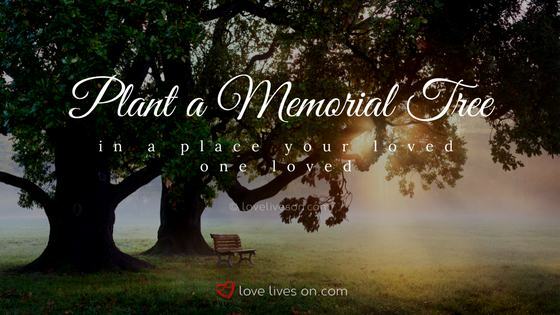 Take flowers to your loved one’s resting place. 81. 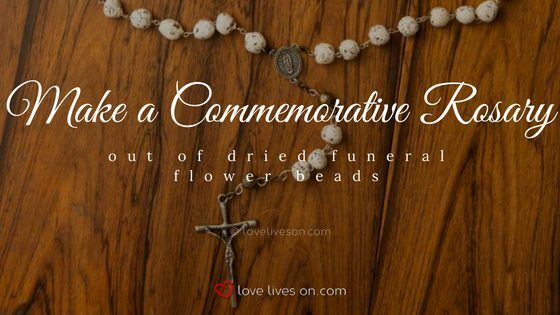 Turn dried funeral flowers into beads, and assemble the beads into a beautiful rosary. 82. Tell the little ones in your family lots of stories about your loved one. Keep special stories alive in the family by creating a storybook. Have the children in the family create illustrations for the storybook. Once the stories have been written, and the illustrations drawn, bind the book together. Have a copy made for each child in the family. 83. Go on vacation to a favourite place you used to travel to with your loved one. 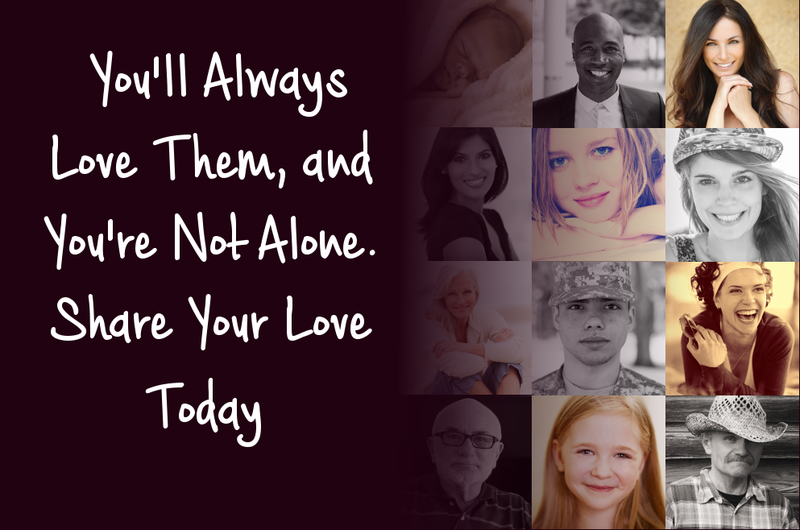 While there, take the time to remember your loved one and feel his or her presence. 84. Looking for a celebration of life idea for kids? 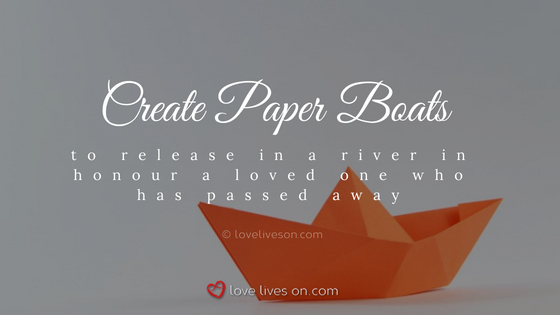 Have the little ones in your family create boats to honour a loved one who has passed away. After they have created their boats, they can decorate them and write the loved one’s name. After the craft project is finished, the family can gather at a river where the children place the boats in the water and watch them float away. This is a good time to share a prayer or memories of your loved one. The boats could also be released during a celebration of life service. 85. Learn to make the recipes that your loved one was famous for. 87. 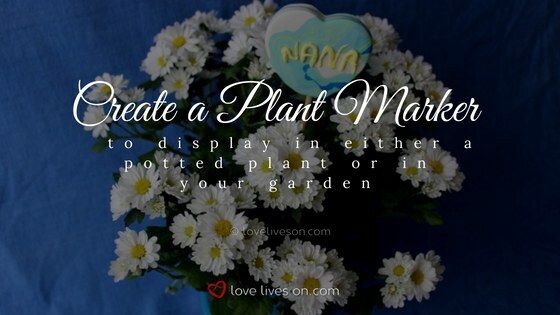 Create a plant marker to commemorate your loved one. The plant marker can be display in either a potted plant or in your garden. It also makes the perfect gift to give to guests that attend a celebration of life service, particularly if the loved one who passed away was an avid gardener. 88. If your loved one was a prolific traveller, frame a large map of the world. 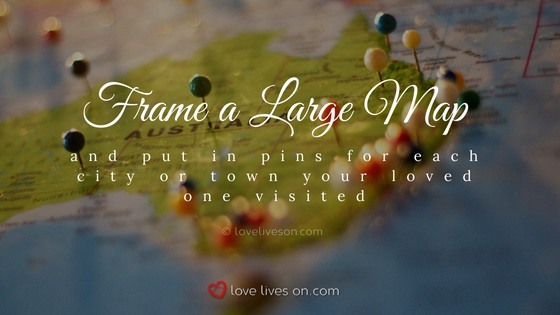 Put in pins for each city or town he or she visited. Attach a small label to the pin with the date of the visit. You could also have photographs from his or her travels as a boarder for the map. Each photograph could be numbered, and correspond to a numbered pin. 89. Here’s another great celebration of life ideas for the youngest members of your family. Have children make a kite. 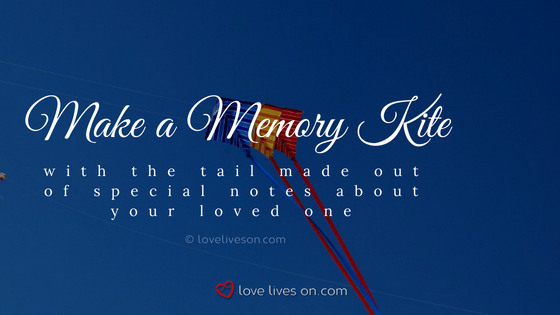 The tail of the kite is made up of ribbons, on which each child writes a message to the loved one who has passed away. When the kite has been completed, the children can fly the kite at a place that was special to the person who passed away. 90. 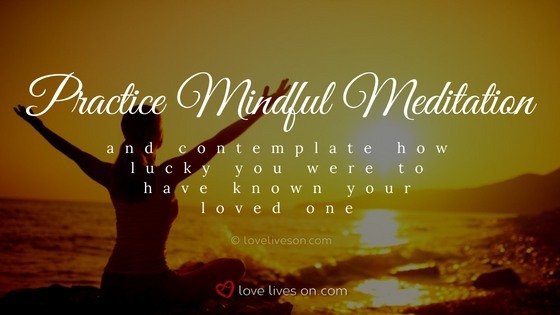 Practice mindful meditation. 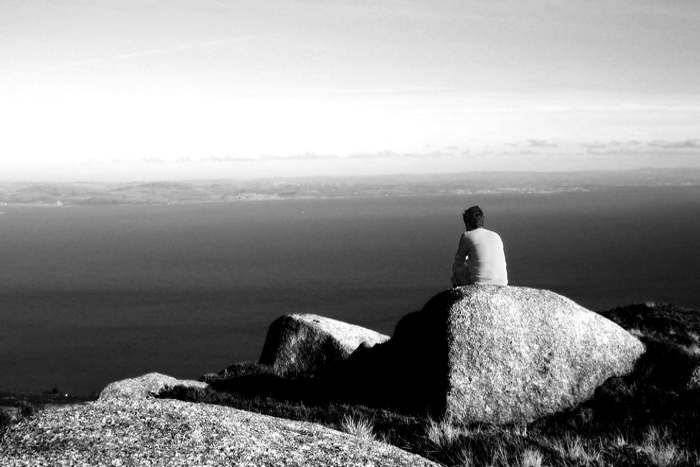 Sit in a quiet place and contemplate how lucky you were to have known your loved one. Focus on your breathing. 91. Send family and friends a card made from seed paper on your loved one’s birthday. The card could contain a quote, or other special message about your loved one. Family and friends plant the card in the ground, and the seeds will bloom. You could also give the card to guests at a celebration of life service. 92. 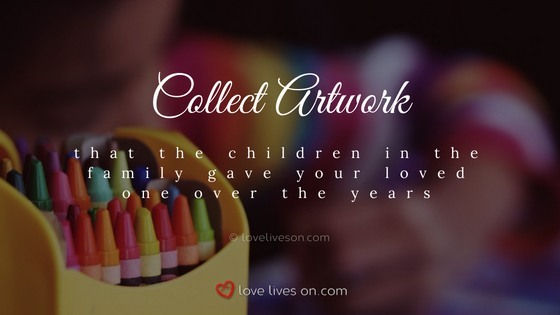 If your loved one was a parent or grandparent, collect all the artwork that the children in the family gave him or her over the years. Have the drawings and paintings turned into a book. Give a copy of the book to family members and friends as a special gift. 94. Create a pendent from polymer clay with a love heart intertwined with an infinity symbol. You can etch your loved one’s name into the pendent. Once you have baked the pendent, hang it on your favourite chain. This simple craft project can be used to make gifts for guests at a celebration of life service. 95. 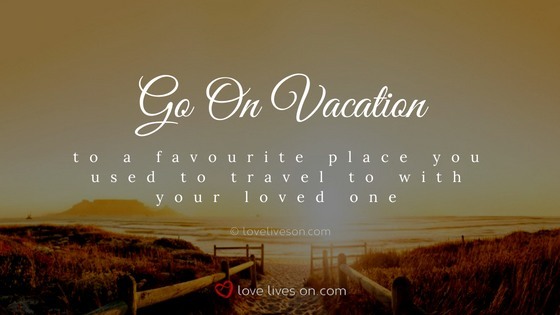 Take a road trip and visit all the places that were significant to your loved one and your family. Take photographs in exactly the same spot where your loved one was previously photographed. 96. If your loved one was an avid fisherman, create a special lure and name it: “The [First Name of Your Loved One]” (e.g. “The Tom”). Make one for everyone who knew him and loves to go fishing. It’s a pretty cool celebration of life idea for families that grew up fishing! 97. Host a slide show and home movie night for family and friends. Everybody will enjoy the trip down memory lane. This could also be incorporated into a celebration of life service. 99. 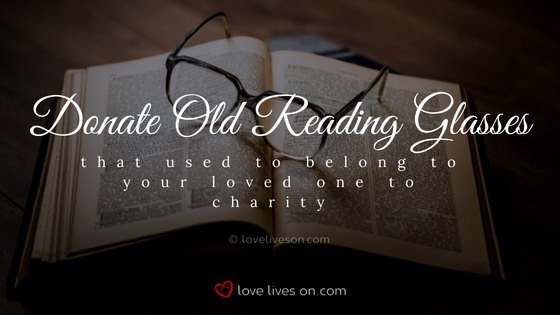 Donate your loved one’s reading glasses to a charity that sends them to underprivileged people. 100. If your loved one was a sports lover, sponsor a little league team. Have team jerseys made. The tag on the jersey could say: “Made in Memory of “[Deceased’s name]”. Attend the little league games with your family and friends. 101. At Easter or on another special occasion, have a treasure hunt for the little ones in the family. 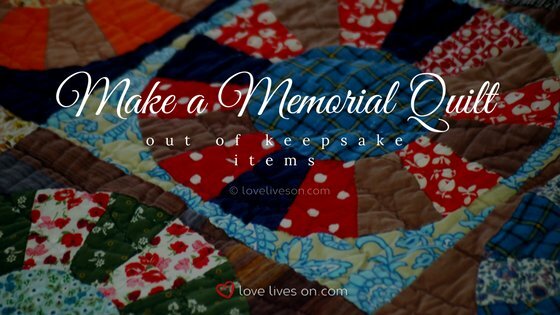 Hide little mementos that were owned by a loved one who has passed away. You can also hide scrolls tied with a pretty ribbon. When a child unrolls the scroll, they can read a quote or message from the loved one. The kids will love being involved with this unique celebration of life idea. 102. Create memory balloon decorations for your loved one’s celebration of life service. Tie your favourite photos of your loved one to pieces of ribbon that can then be attached to helium balloons. These will float from the ceiling at your loved one’s celebration of life. 103. 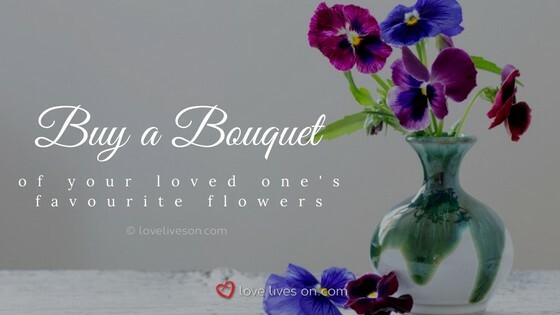 Create your own DIY floral arrangements in the shape of your loved one’s name. 104. Create a DIY photo table runner out of your favourite photos of your loved one to use in the table setting for a celebration of life reception. 105. Was your loved one known for his or her obsession with a certain kind of food like cookies or cupcakes? Create a food bar at their celebration of life ceremony serving all sorts of variations of their food favourites. We’ve put together an infographic to help you plan a meaningful and personalized celebration of life ceremony for your loved one that you can easily save to Pinterest or share it on social media. 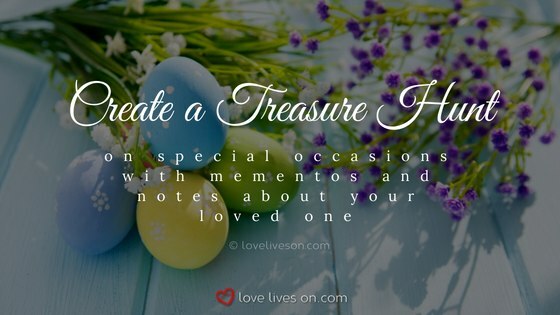 If you tried any of these celebration of life ideas, or have any further ideas to add to our list, please let us know in the comments box below. We would love to hear from you! You can also follow our Pinterest board for even more inspiring celebration of life ideas. It’s important to keep our loved ones’ legacy alive, now and forever.